Installers who carry out work on powered gates run the risk of criminal prosecution under health and safety legislation – even if the wiring and other electrical work undertaken follows the regulations and is to a high standard warns the Door & Hardware Federation (DHF) Powered Gate Group. Liability for the operating safety of an automated gate can rest with the last person who has carried out work on that particular gate. 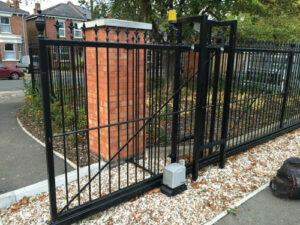 If the gate is unsafe for a reason unconnected with its electrical operation – because crushing or impact forces are too high, for example – then an installer who has worked on the gate could still be responsible for its overall safety. This is because he/she is under a legal duty to ensure the gate is left in a safe condition when repair or maintenance work of any sort has carried out, explains the DHF Powered Gate Group. Said DHF training officer Nick Perkins: “Since 2005 there have been seven deaths in the UK and Ireland, at least nine serious injuries and countless near misses caused by dangerous powered gates. 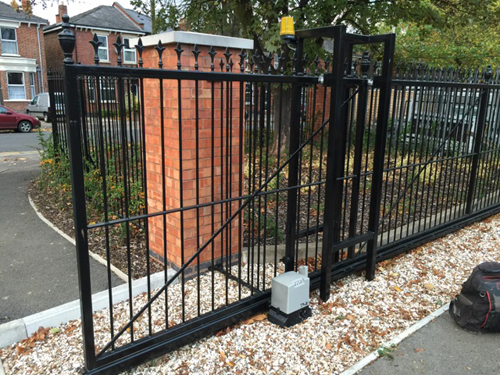 It’s estimated that only 30% of the 500,000 automated gates in service in the UK are safe to use as a result of the general lack of awareness of the legal requirements covering powered gates. So it’s highly likely that a powered gate that an installer has been invited to work on is actually not safe. So any work carries out on it would make him/her liable for the gate’s ongoing safety under the Health and Safety at Work Act 1974, Electricity at Work Regulations 1989 and possibly the Workplace Regulations 1992. He pointed out that powered gates are considered to be machinery in the eyes of the law and as such are covered by the Supply of Machinery (Safety) Regulations 2008 (SMR). Some electrical or security professionals may not have complete knowledge of SMR, and may not have the specialist force/time measuring equipment to set up and check the safety of any “contact” safety systems used on the gate.